It is important to teach your child good oral hygiene habits as soon as possible. Doing so can help your child maintain healthier teeth and gums throughout their life. Good oral hygiene habits include daily brushing and flossing at home, as well as regular dental checkups that include an exam and cleaning. At ABC Kid Dental, Dr. Roy Delappe, Dr. James Jensen, and Dr. Sara Hakim are your experienced and friendly kids dentists in Reno, NV. A great way to help your child develop good oral hygiene habits is by encouraging them to participate when brushing. 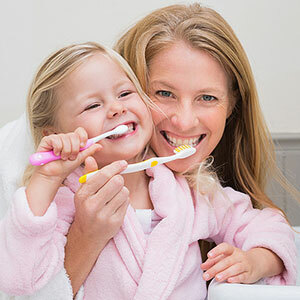 Like adults, children should brush their teeth twice a day for approximately two minutes at a time. Help young children with brushing to ensure no areas are missed. Children three years and younger should brush with a training toothpaste without fluoride. After age three, children can begin using a toothpaste with fluoride. 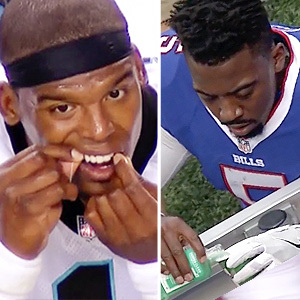 Be sure to also help your child floss once a day as part of their oral hygiene routine. An important part of developing good oral hygiene habits is visiting the dentist regularly. Regular dental exams allow your Reno kids dentist to identify potential problems, such as tooth decay, early so they can be treated before they become more serious. Another important aspect of getting regular dental checkups is having your child’s teeth cleaned. Dental professionals have the tools and experience to give your child’s teeth and gums a more thorough cleaning than can be achieved at home. Children can begin seeing a dentist within six months of getting their first tooth. Teaching your child good oral hygiene habits promotes healthier teeth and gums and can help them establish good habits for life. 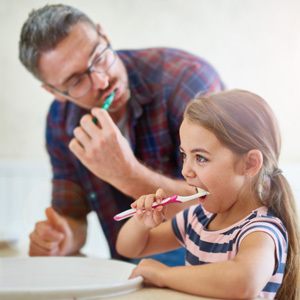 Your child’s oral hygiene routine should include brushing twice a day, flossing once a day, and regular dental checkups with professional teeth cleanings. To schedule a dental checkup for your child with Dr. Delappe, Dr. Jensen, or Dr. Hakim, your Reno kids dentists, call ABC Kid Dental at (775) 825-5005 for the Reno office or (775) 470-5070 for the Sparks office.